Washington – During a Feb. 15 congressional briefing on OSHA’s final rule on protecting workers from exposure to respirable crystalline silica, Daniel Anna, past president of the American Industrial Hygiene Association, held up a respiratory protection mask. “For those of you who may not have worn something like this on the job, let me tell you, it’s not a real fun thing,” Anna said. As Anna and other AIHA officials see it, the final rule’s established engineering controls to limit worker exposure to silica would prevent the need to use a mask throughout an 8-hour shift. It is one of several potential benefits discussed during the nearly hour-long session, which also featured remarks from former OSHA administrator David Michaels and members of Congress. Crystalline silica is a known carcinogen found in sand, concrete, brick, stone, mortar and other commonly used construction materials. It often surfaces during high-energy operations such as cutting, drilling or crushing rock. Silica dust also can be found in hydraulic fracturing, foundries, glass manufacturing and landscaping, among other industries, AIHA CEO Larry Sloan said during the briefing. 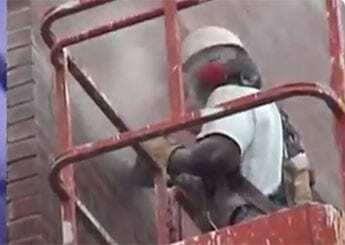 OSHA estimates that 2.3 million workers are exposed to respirable crystalline silica. Exposure to silica dust can trigger silicosis, an incurable lung disease in which the lungs become scarred and affect breathing. OSHA claims the final rule, issued in March 2016, will save more than 600 lives and prevent more than 900 cases of silicosis each year. The rule lowers the permissible exposure limit for respirable crystalline silica for all industries to 50 micrograms per cubic meter of air averaged during an 8-hour shift. The rule further covers requirements such as engineering controls, respirator availability and limited worker access. Stakeholders and AIHA members have reported increasing employer comfort with the rule’s exposure limits, Anna contended. “Once they recognize what controls are being requested and what technology is available that prevents those exposures, the implementation is nowhere near what they expected,” he said. OSHA presented the rule as separate standards – one for construction and one for general industry and maritime. Both went into effect in June, with industries then having one to five years to meet most requirements. At press time, the construction industry was expected to comply by June 23, and general industry, maritime and hydraulic fracturing industries by June 23, 2018. Hydraulic fracturing will have until June 23, 2021, to meet engineering control requirements. During the briefing, Michaels dismissed concerns that the legislation would decrease the workforce. Michaels said that although the final rule would cost industry $ 1 billion per year, its annual net benefits were expected to range between $ 3.8 billion and $ 7.7 billion. “We’re talking about people not dying of cancer and silicosis and having productive lives, and that’s what the benefit is. The benefits are many times the cost,” Michaels said. Reps. Joe Courtney (D-CT), Carol Shea-Porter (D-NH) and Darren Soto (D-FL) also were present at the briefing. Shea-Porter admittedly brought a “personal interest” to the proceedings. A former factory worker once exposed to chemicals herself, Shea-Porter said her mother, a former shipyard worker, died from chronic obstructive pulmonary disease – although she noted that her mother’s occupational exposure was not necessarily confirmed as the root cause. In addition, Shea-Porter said her mother-in-law died from lung disease. “So when I think about workers who are unnecessarily exposed to this when there are ways to mitigate the impact and reduce the exposure, it just seems like a no-brainer,” Shea-Porter said.